These studious looking unisex eyeglasses can help you make your mark and carve out your own personal style. Durability should always be one of your priorities when you look for new eyewear, which is why these plastic eyeglasses' Ray Ban RX5268 frames are ideal. If you're the active and practical type, you'll benefit from having plastic frames. The thick fully rimmed frames are a real showstopper. 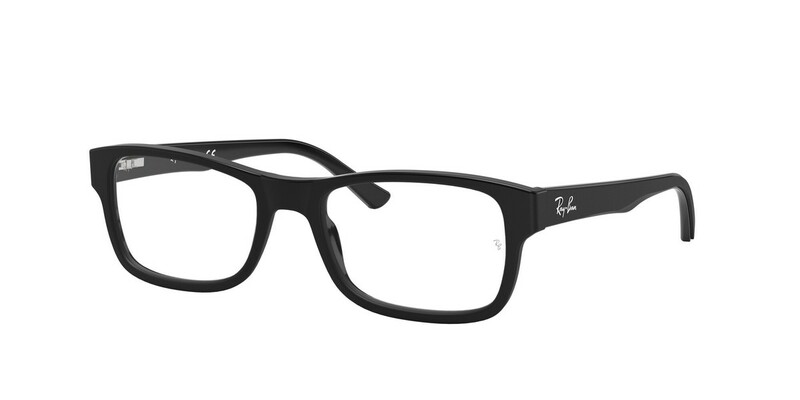 You'll be able to let your personality shine through your Ray Ban RX5268 eyewear with these unorthodox eyewear frames. These sharp-edged rectangular frames with thicker edging are statement glasses that offer a bold look, which only some people can pull off. Perfect for those with round or oval faces, these Ray Ban RX5268 frames will help add more definition and give you some serious street-cred at the same time. These carefully crafted timeless frames will help you adapt to any style. If it's �professional' you're going for, these classic Ray Ban RX5268 frames will help leverage your professional look - and if you're looking for a career change, you'll surely be hired, because everyone appreciates a bit of classic beauty and competence now and again.